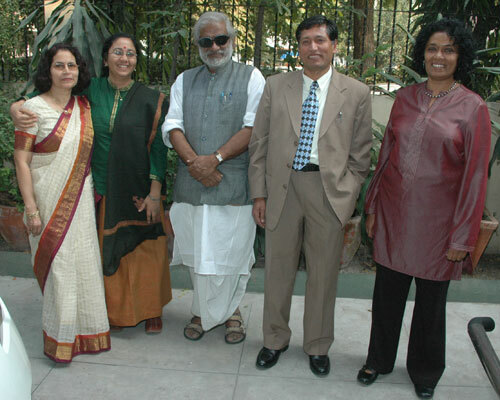 The reference group members present at the meeting in Delhi, from left to right: Rita Afsar, J. Devika, Dipak Malik, Tek Nath Dhakal and Kumudu Wijewardena. Prof. Zulfiqar Bhutta, Department of Paediatrics, Aga Khan University, Karachi, Pakistan, whose application for an Indian visa was delayed, was absent. The participants all regretted that Dr. Bhutta was unable to attend. The workshop was organized informally and as a “think tank” session, and was held at the the Nordic Centre in India flat in Nizamuddin East, New Delhi. Although we had an agenda, it was agreed that we could depart from it whenever necessary. The atmosphere at NCI was conducive to an open and relaxed discussion, and the results were very fruitful. Those present had already met each other the day before. We began the session by providing information on the Nordic Centre in India consortium (NCI). 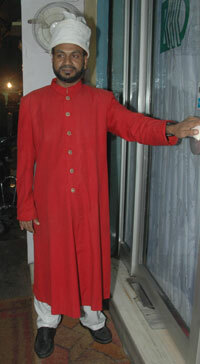 We were assisted by Mr. Malik, the manager of NCI. SASNET’s Director Anna Lindberg in a discussion with Kumudu Wijewardena and Rita Afsar. Although most members of the reference group were acquainted with SASNET’s background, structure, and aims, we described it in depth for the benefit of the group’s new member, Dr. J. Devika. Participants asked relevant questions and contributed to a discussion of various aspects of SASNET’s activities. The members and their institutional affiliations were then introduced in more detail in order to find areas of common interest and develop ideas on how to network and collaborate in the future. Some participants cited successful projects that were initially funded by SASNET, and suggested that we bring people who have been involved in such projects together in a workshop so that they can share their experience of successful collaboration with others. 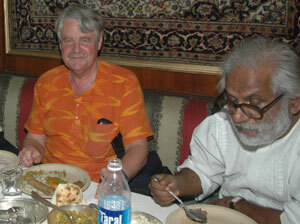 Lars Eklund and Dipak Malik at Karim’s. We ended the session at the Nordic Centre on positive note minds, with many of those present commenting they felt very encouraged by the meeting. If the day was a success, it was the result of our joint efforts and everyone contributed in a significant way. On behalf of SASNET we were very grateful that the members of the reference group gave of their time to meet with us. The meeting was productive, efficient, and very cordial. After the meeting we gathered for a lovely dinner at Karim’s famous Restaurant in Nizamuddin West (photo to the left), near the mausoleum of the Sufi saint Hazrat Khawaja Nizamuddin Auliya.